This week’s National Bike Summit culminated in an ambitious new campaign to recruit a million bike advocates and the unveiling of a new Google Maps bike feature. But in a Wednesday session dedicated to the outlook for federal bike investments, cycling advocates hesitated to declare that they could secure new commitments from Washington. "If Congress is going to act" on a new long-term transportation bill, Rails-to-Trails Conservancy president Keith Laughlin said, "it’s definitely going to be our year. If we are ready." 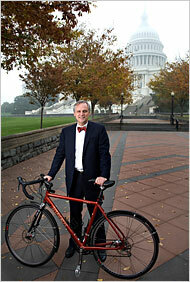 Laughlin’s phrasing was aimed at stoking cyclists’ appetite for lobbying Congress in favor of pro-bike legislation, such as Rep. Earl Blumenauer’s Active Community Transportation Act. But his caution also reflected the ongoing uncertainty surrounding how lawmakers plan to pay for a new long-term infrastructure bill expected to cost at least $450 billion. Even if bipartisan support can bring the White House on board for a new bill this year, it remains to be seen whether bike advocates can secure the $2 billion in competitive federal grants that Blumenauer has proposed. Tyler Frisbee, an aide to the Portland lawmaker who spoke to the Summit on her personal time, was careful to praise House transportation committee chairman Jim Oberstar (D-MN) as a friend of bicyclists. But Oberstar’s transport legislation, Frisbee said, is "not the bill we want for another eight years … cycling will be light years behind Europe [if it passes]." Frisbee warned fellow bike advocates that Oberstar views the Blumenauer bill as an expansion of the Non-Motorized Pilot Program that directed $25 million to four trail projects in the 2005 transportation law. Describing her boss’ legislation as separate from that spending, Frisbee said a Senate version would be introduced soon by Oregon Democrat Jeff Merkley. Despite the hazy outlook for congressional action on transportation reform, Rails-to-Trails is continuing to push ahead with its long-term agenda. Laughlin said the group’s 10-year goal is to help pay for bike trails within three miles of 90 percent of American residences, while doubling existing federal bike spending to $9 billion over six years. "If the bill comes up for a vote, we have a fighting chance, but to win" requires sustained and increased focus on grassroots lobbying of lawmakers, he said. The less money there is overall, in government and in the economy, the better for bicycles, because it is the low cost option for transportation and (other than walking) exercise. i’m guessing most congressfolk view bicycles as recreational options rather than transportation options. that’s unfortunate, but not surprising given that in most us communities, less than 2% of the population uses a bike for transportation. it seems there is a need for a dynamite marketing campaign to educate lawmakers on the potential that bike infrastructure and bike-friendly policies have to get more people on bikes and to highlight what the resulting benefits are. something quick and to the point, something that feels real and not like a fantasy, but at the same time captivating. has anyone seen such a campaign? Is the FAST Act Good for Bike Funding?